Some used ford mustang parts are a great deal and a solid alternative to new parts, while some should be avoided at all costs. Use this as a guide to finding good used Mustang parts for new and classic pony cars. If you've been searching for used parts online like me, you've probably become frustrated with the many useless listings that only lead to more websites and jumping through hoops to eventually find parts. While the web is a great place for information and to buy new Mustang parts, body kits, and performance parts, it's severely lacking in the ability to easily find the gently used pieces for your Ford Mustang. 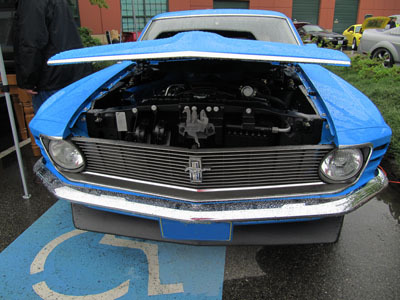 As the heading suggests, searching locally for parts for your pony car should be your first stop. Unless you have a very rare model of Mustang, shopping locally will eliminate shipping and be a lot easier to see if you are really getting a good deal. I always start with the local bargain finder paper, and with Craigslist in and around my town. The best local search engine isn't on the internet. It's your trusty old yellow pages book. As far as I'm concerned, the internet variety of the book can't hold a candle to the printed version, for easily locating sources and phone numbers of used Ford Mustang parts. Wrecking yards specializing in the age range of your car is a good place to start. If you're mechanically inclined (and I assume you are if you're looking for used Ford Mustang parts), the better deals are the yards that let you remove parts yourself with your own tools. Find the Craigslist listing closest to where you live and in the auto parts section, search by year. The simplest way to find specific parts, unfortunately, is to search by year and then drill down to the specific part or parts you need. Like the rest of the world, be careful for scams. Although there are more car purchase scams on Craigslist, there are some out there as well, for hard to find specialty parts (eg. Boss 302). While on the topic of searching Craigslist for used Ford Mustang parts like, a 1965 Mustang V8 or even more specifically a 1965 Mustang 289 V8 may not show up as many listings as a search only for 289 V8, or just 289. For specific harder to find pieces, you may want to try a few kinds of searches. Try cobra jet and if you get nothing good, try cobrajet. If that doesn't produce results, you could also try cobra, but be prepared to find every auto part with the word cobra in it to show up. Another area where specifics helps, is with parts or engines that are well known by their nicknames. For instance you may have better luck finding used high performance 289 engines or specific ones searching for "K code" or 5.0 or boss 351 rather than 1971 Mustang 351. Auto Wreckers can be a good place to find a used engine. Although they may tend to be a little more expensive, they usually come with some kind of guarantee. Same goes for transmissions. A few years back I picked up a used transmission that seemed fine. bolted it up and it wouldn't shift properly. While it cost me my time to pull it and get another replacement. I wasn't stuck with a lump of coal for a transmission and having to go out and buy another. While the best parts may be cheap used mustang parts, sometimes bargain prices are no bargains. Be sure you know what you are buying. I was looking for a used rear valance for my 1965 Mustang restoration and was "guaranteed" that the part I was being shown was for a 65 or 66. The problem, was that the piece was actually from a 1967 Mustang, which looks the same externally, but is actually slightly wider, has differently shaped outer edges and whose outer brackets are different and in completely different locations.